I think it was around 4am when I clumsily stumbled out of the tent. Half dressed, barely conscious and feeling like an overtired toddler home from a long road trip, I grabbed our rain fly and struggled in my daze to figure out which end was up. We'd fallen asleep under the stars but the sparkling night sky had turned to grey while we slept. In its stead was our worst enemy (so far): rain clouds. Groggily I roused Tara to help me and together we managed to deploy our rain fly before anything got too wet. One uncoordinated high-five later and we were both fast asleep, safe and sound in our water-proof tent. A few hours later we awoke for real and were pleased to find it hadn't rained much. The sky was still overcast but it didn't look too threatening. We removed the rain fly with infinitely more coordination than we had installed it and I was able to spend the entire morning and early afternoon working without having to huddle in the shade. Tara made good use of our off day, heading in to town to bring home a bounty of fresh fruit as well as doing our much needed laundry. I made a clothesline for her and we hung our wet garments out in the sun to quickly dry in the heat and wind. After Skyping with clients and accomplishing quite a bit of work I took the rest of the afternoon 'off' to join Tara for some actual relaxation on our rest day. 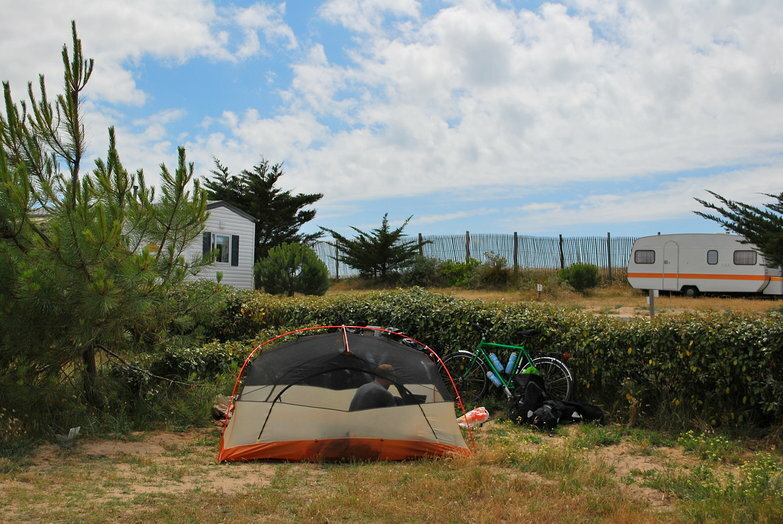 It seems like all French campgrounds near the coast are competing to see who can build the most opulent pool and our campsite was no exception. Tara and I happily spent at least an hour bobbing around completely alone their massive pool. It is so much nicer camping when the weekend is over and everyone has gone home! After our swim Tara wanted to head down to the beach to do some drawing. I joined her, taking my tattered copy of In Cold Blood with me to read (the only book I could find in English at the campsite 'take a book/leave a book' shelf). We walked out of camp down a short thorny path and over a sandy berm to the beach. Arriving on the other side we were instantly greeted with blasting winds that made short work of filling every exposed (and some unexposed) nook and cranny of our bodies with sand. Undeterred we tried our best to relax in the sand storm but we wound up giving in and heading home shortly after I commented that I ought to be reading Dune. Tomorrow we'll circle the island and start heading south to La Rochelle. For now it is time to watch our first episode of Lost, at night, under the stars and on an island!